James achieved a First Class Law Degree from the University of Plymouth in 2017. James is proud to have had his third year thesis published in the Plymouth Law Review which was also selected for the Dean’s list of academic achievements. James furthered his legal studies by completing the Legal Practice Course with the University of Law in Exeter, whilst also achieving a Master of Laws in 2018. 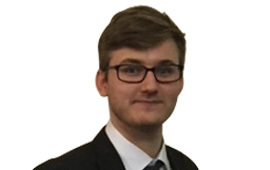 James has worked at QualitySolicitors Dunn & Baker as a Paralegal since January 2018 and started his training contract in September 2018. James’s first seat of his Training Contract is working within the Private Client department where he is gaining experience in dealing with Wills, Trusts, Probate and Lasting Powers of Attorney. During James’s training contract he looks forward to experiencing a variety of different areas of law and the experiences these will bring, whilst also providing high levels of client care and support. James has previous experience working as a Paralegal in the Personal Injury Department for a Legal 500 firm in the South West. Here James assisted various Solicitors in both high and low value personal injury and clinical negligence claims. James describes himself as meticulous, enthusiastic, reliable and friendly.